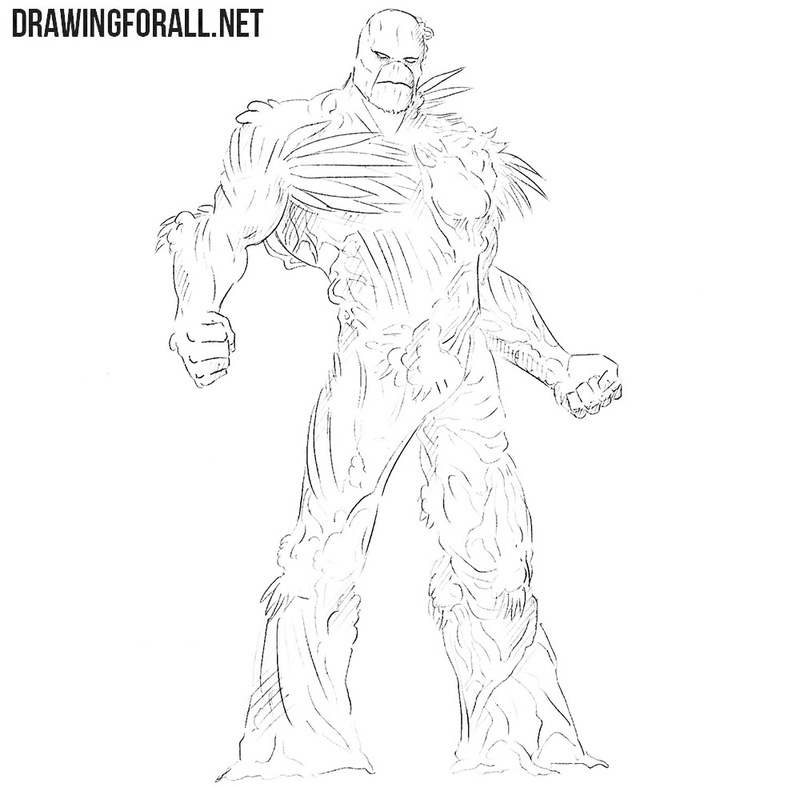 Today we will show you how to draw the Swamp Thing from DC Comics Universe. 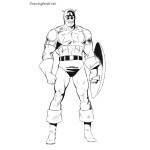 He is not the most popular comic book character, but we hope that fans of the DС Universe will like this drawing lesson. This step is only needed to mark position of the hero on a sheet of paper, so we need to use very light lines in the first step. 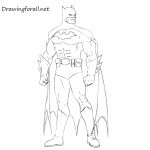 In this step we will create a silhouette of the character. 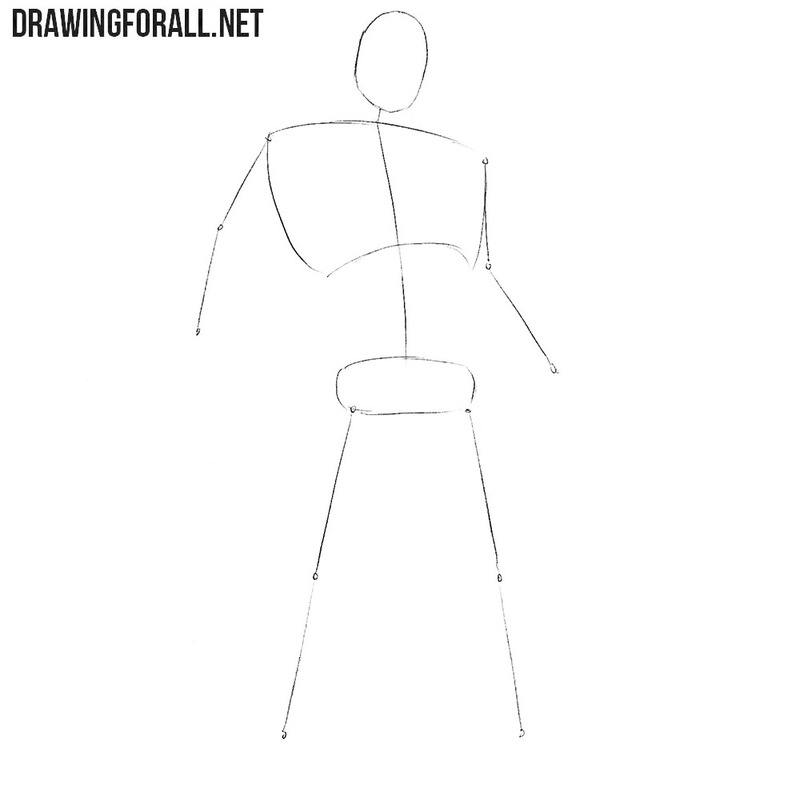 Draw round balls of the shoulders, after that connect them with a head, using a pair of lines (you probably guessed that we mean neck). Note that the shoulders are about the size of the head. The next action is the drawing of the arms – they are represented by round figures. Sketch out the silhouettes of the hands. Using a semi-circle draw the torso which narrows to the waist. At the end of the step we draw the contours of the legs. It’s time to draw the details. First of all, draw little frowning eyes with horizontal eyebrows. Below we draw the mouth. As you can see our hero does not have a nose – it is really interesting feature. 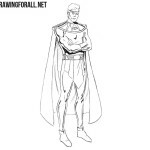 Use the intersecting lines from the previous step to draw the details of the face. Now let’s move on to the body. You can see a lot of lines on the torso. We recommend to draw large details at first, such as leaves located on the left large pectoral muscle. Next draw lines located on the stomach and neck. After this actions erase all unnecessary guidelines from the first steps. 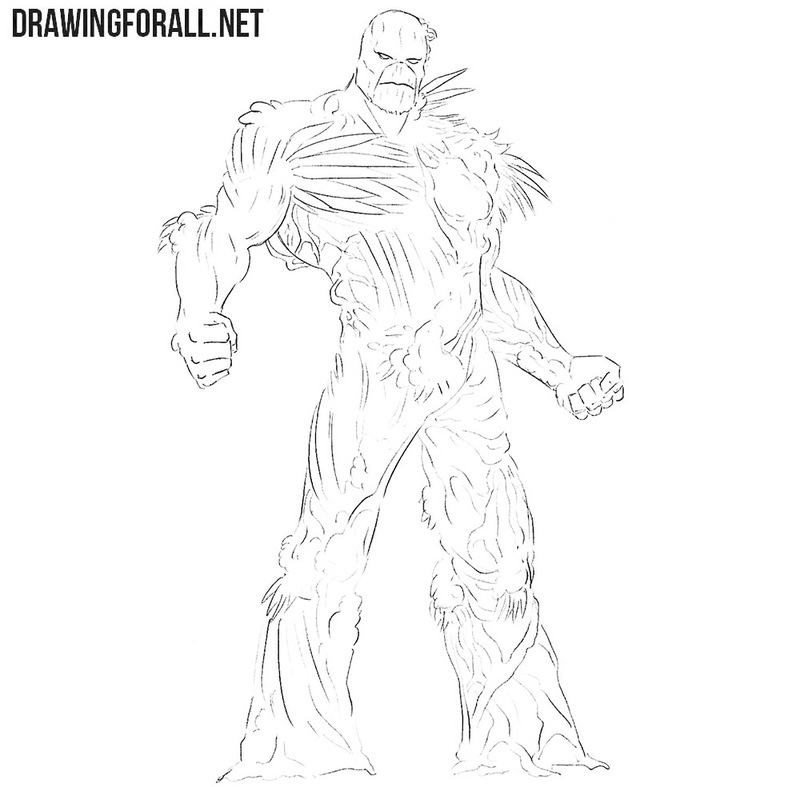 Now let’s draw the arms of the Swamp Thing. 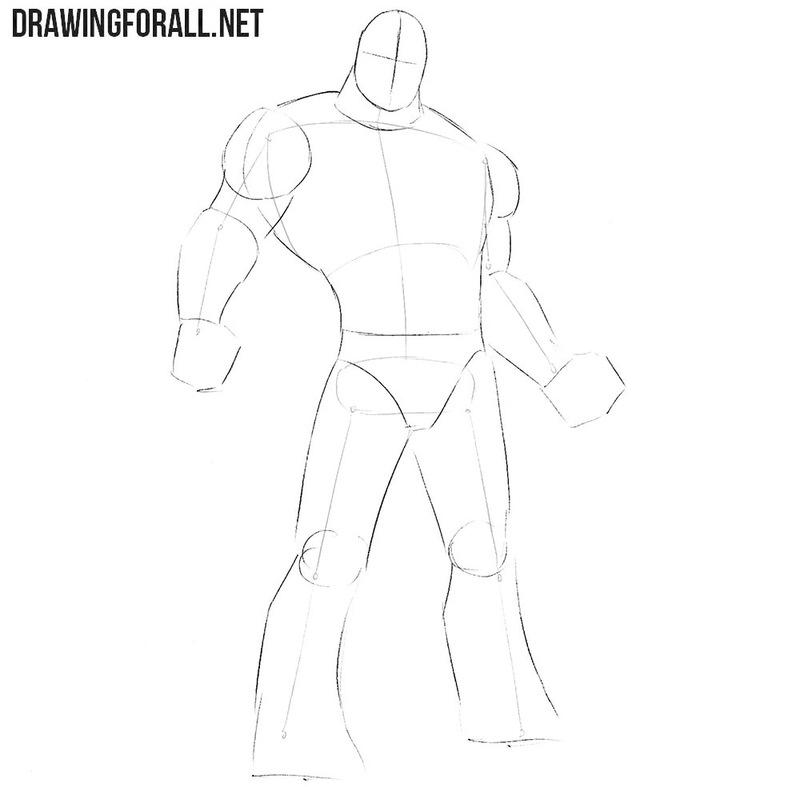 Continuing the shoulder lines, we need to accurately draw wide deltoids, then outlines of biceps and triceps, which smoothly pass into the forearms. Next draw the hands, considering all the knuckles. After that draw leaves and stems. If you have problems with palms and fists (it’s really hard part of this tutorial) don’t forget to read this article. 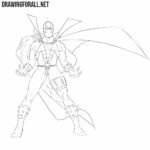 If the top of this character is ready, then it’s time to draw his lower part. First, draw out long hair in front of the hips. Further, with the help of long, clear and smooth lines, we carefully draw out the outlines of the leg muscles and wavy hair on the legs. In the same step we draw the outlines of the feet. 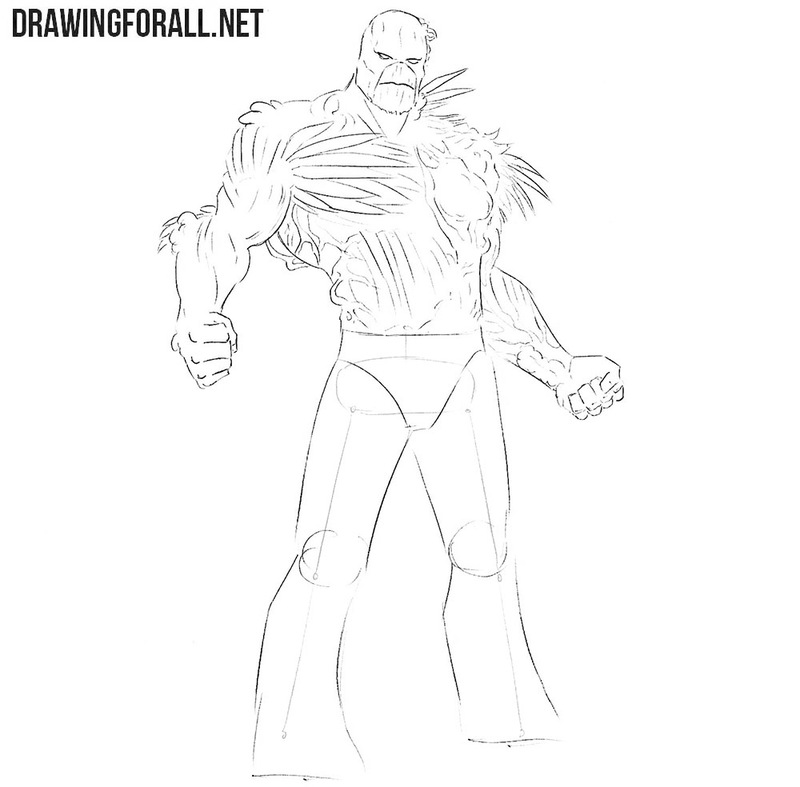 And now we have the last step in the drawing lesson about how to draw the Swamp Thing from DC. 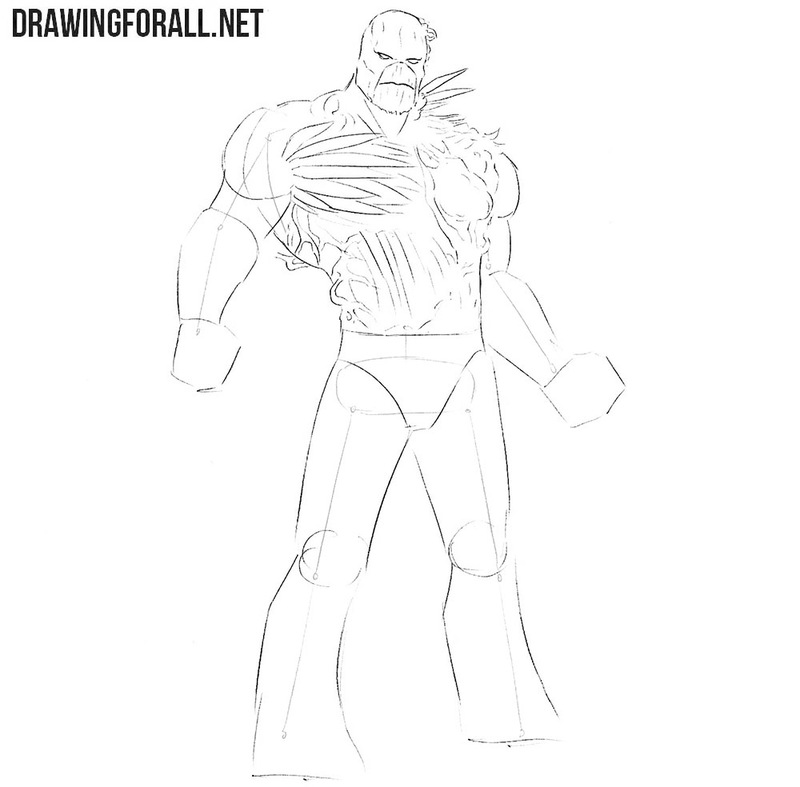 Here we need to add a very light shadows on a Swamp Thing’s costume. 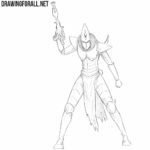 You should use classic hatching for this action. It was really difficult work, but we got a very good drawing of the Swamp Thing. 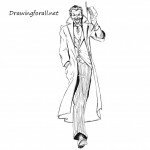 If you like this drawing tutorial, do not forget to subscribe to us in social networks and share this drawing lesson.